No need to have a large predictive change between the tire cold and at the end of a session. No need to guess a starting pressure based on the current temperature of the tire (how long since the last session) and the ambient temperature. Hit the track at speed. Do not run the risk of spinning and ending up in a gravel trap because the cold tires were not up to temp and pressure yet. Maximize your time on track. If it takes 2 to 3 laps to bring a cold set of tires up to temperature this can be consuming as much as 25% of your session time. Reclaim your expensive track time and have tires that are at full performance much faster. When tires are heated and then cooled the rubber in the tires becomes progressively harder. How much harder and how this affects the performace of the tire depends on the tires, but after a number of heat cycles the tire is no longer as fast as it was earlier in its life. Using tire warmers helps to limit the number of heat cycles when the tire warmers are used between track sessions. If you have more than one track session in a day, it makes sense to save the heat cycle and keep the tires warm. · See actual tire temperature while the warmer runs. · On controller box (with two readouts and controls) per side of car, so no messing around with 4 individual controls and plugs, just one per side of car. · Temperature set point is changed with a touch of a button. · Use higher set temperature for preparing to go on track. 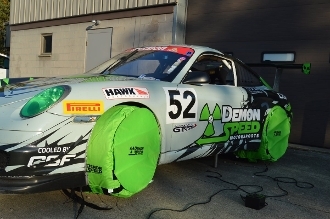 · Offered in high visibility green so as not to mistakenly let the car down with the tire warmers attached. Tire warmers are now avaliable in stock in 3 sizes to fit all of the Porsche Cup cars from 996 through 991. If you do not know if your tire size will fit one of what we have in stock, just contact us for proper fitment. Customer sizes are avliable. We can make tire warmers for any size.